March 2, 2014: The Second of three WFMU Fundraising Marathon shows, with Sue P.
Charles Bradley Stay Away This is from my CD premium Double Coverage, which automatically goes to everyone who pledges at least $75 during this show. Call 800-989-9368 or pledge at wfmu.org. Tony Babino Shiny Happy People This is from my CD premium Double Coverage, which automatically goes to everyone who pledges at least $75 during this show. Call 800-989-9368 or pledge at wfmu.org. Godfrey Daniel Groovin' I've decided to also include this on Double Coverage. 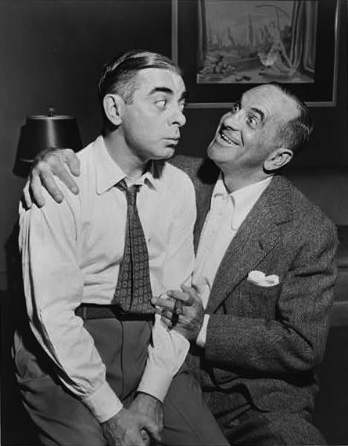 You can't have fake Al Jolson without fake Eddie Cantor. It's only fair. Big Daddy Super Freak This is also from my CD premium Double Coverage, which automatically goes to everyone who pledges at least $75 during this show. Call 800-989-9368 or pledge at wfmu.org. Welcome to the partay, folks! Show Gaylord some love by pledging your support. Once again, I have opened comments, and, once again, I don't know why. Because they're the carnivorous plant of radio? Now I remember: I did it to implore people to pledge to Sue P. and me here at wfmu.org or at 800-989-9368. But I'll also accept your version, Uncle Michael. Hello Mr. Fields. Did someone put creatures in your ear on Ceti Alpha V? I've fallen into the pitcher plant of Gaylord's show and I'm powerless to extricate myself. just chuck it some Taylor ham and use WD40 and you should be fine UM! Totally superfluous, as RRN63 says, but also pleasant, since the opportunity rarely presents itself. This Charles Bradley tune is on Gaylord's amazing premium! You will not be disappointed, people. Hey there, Sue P. & Gaylord. Good luck amassing pledges this evening. Greetings and Merry Marathon To DJ Gaylord, Sue P., and all the Gaylordians here gathered. @Rev: Maybe it is superfluous, but allow me to take advantage of this rare opportunity to comment here by THANKing Monsieur Fields for his tireless service as one of the CORNERSTONE talents on FMU for lo, these many years! Thank you all for the kind words. I am chuffed. @P-90: Their bikini wax hegemony ends now! U-S-A! U-S-A! U-S-A! There are lots beautiful people here in the studio waiting to talk to you: 1-800-989-9368! Comments are good, Gaylord. It's like having a hundred little co-hosts with you urging folks to pledge. PLEDGE EVERYONE! Gaylord is a precious resource that does so much for our Sunday evenings. Don't take him for granted. "Godfey Daniel" was W.C. Fields's standard film double entendre for goddammit, often in the presence of small children. poutine, schmoutine. get somebody to point you to st. viateur bakery. best bagels in the universe. kathryn from hoboken was me, hence the appreciation for DJs who fake foreign band names. Tony Babino - Shiny Happy People ^0^ the future just got better = thank you! I don't need to watch the red carpet tonight. I'm listening to superstars Sue P & Gaylord! Thanks, Katie! All has come clear now. You cannot deny the bliss that Emil Richards has brought to this world… Maybe not the way he intended. @sugarwolf: That's just the sort of thing a person who has been officially certified as cute by WFMU would say. Only 30 minutes left to show yr love tonight for Gaylord. Help us help you! This MUST be the original version of Superfreak Rick James ripped off! Dammit, Gaylord! How am I supposed to get anything done around here? That's not going to keep me productive when Preston Love is playing but I like the way you think...and the way you DJ.